Kitchen storage, and in particular, pantry storage, can be a thing of beauty that helps you organise your space to make it feel bigger and neater. But you needn't have a walk-in pantry to benefit from these storage solutions – even a pull-out larder or clever cupboard inserts, in other words, small kitchen storage ideas, can help you get your space super organised. Tired of opening your pantry door only to be met with a shower of oats? Rather than cramming in hundreds of bags, boxes and half empty packets, keep dry ingredients like flour, pasta, pulses and cereals in clear, storage jars. Use tape, or get fancy with a label maker, and name each container so you know exactly what’s in each. Remember to also write on the expiration date. These jars are from jars from Ikea. We’ve said it before and we will say it again, don’t forget to put the back of your kitchen (or pantry) door to good use. This space is easy access, so store things like smaller snacks or frequently used spices – you can just grab them and go without have to wrestle with a mountain of tins. Pantries: the place where tins and jars go to die. Bite the bullet and have a sort out of all of all your cans, spreads, tins and condiments. Anything with a label that resembles 'Sarah’s Christmas Chutney 2009', get rid. Store what’s left of your cull in drawers or a tin dispenser so you can always see clearly what you've got to work with. If the shelves in your pantry cupboard or larder have large gaps between them, use shelf inserts to create extra levels and practically double the space you have. A clip on basket can also maximise space. Shelf insert from Ikea. Find similar basket at John Lewis. If you are blessed with a walk in larder, even if it’s just a small narrow space, investing in some open adjustable shelving makes sense. You can clearly see where everything is stored and everything is easily accessible. This system from String has a mix of both open and closed storage, ideal for storing food that may need to be kept in lower light. To further prevent the previously mentioned oat avalanche, keep items you use most often in baskets, that you can pull out. Separate your foods into categories and label each basket so you can just grab it and stick it on the table. Gluten free food; breakfast items; posh snacks reserved for book club only: you get the idea. Make using paprika instead of cinnamon a thing of the past by getting your spices in order. There are plenty of storage options out there. Expandable spice racks, spinning spice racks, pull down spice racks, the list goes on. Alternatively, you can even build spice racks into your pantry doors, as can be seen in this Burbidge kitchen. Ah peg boards. Where would we be without you? Even a small piece of pegboard solves many a kitchen storage problem. Kreisdesign have loads of add ons for their pegboards, you can use them to store spices and small jars, or add on some pegs for keeping shopping lists and recipes. Genius. If you have a smaller pantry or you just want to keep all your frequently used items accessible, use a cart as extra storage. That way you can just roll out your most used ingredients when you need them. We reckon this idea would work perfectly for baking supplies – last minute Victoria sponge to make? Just roll out the ingredients without having to waste time battling the contents of your larder. 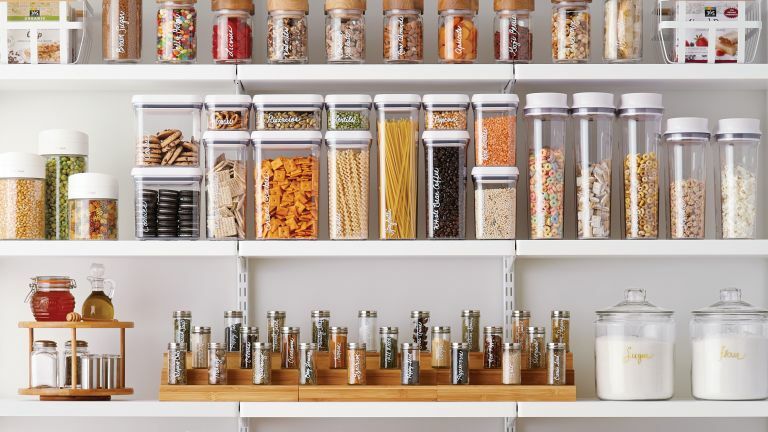 Pantry storage sorted? Get it organised even further by using some chalkboard paint to turn your pantry door into your shopping list, or paint separate panels and label them to match what's on the corresponding shelves. Doors in Oxford Gray chalkboard paint, Benjamin Moore. Find out how to make a DIY chalkboard wall organiser in our easy guide.